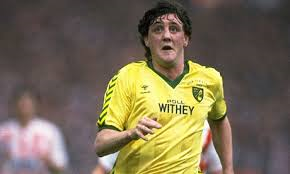 Sunday sees Norwich City take on Ipswich Town in the East Anglia Derby. The sides are currently level on points in 12th and 13th places in the Championship and whichever side loses will surely give up any hope of making the play-offs. Ipswich fans will hoping for a repeat of the ‘Destruction Derby’ of just under 20 years ago – February 21, 1998 – when they recorded a 5-0 win. Swapping the kits from this game was Kevin Smith’s suggestion for today. Norwich had quite a nice Pony kit at the time, designed by Bruce Oldfield, sponsored by Colman’s and notable for the yellow shorts. The change strip was a pleasing green reversal. Such a style is easily transferable and doesn’t lose anything in its Ipswich-ising. Doing a reversal of the Ipswich kit was perhaps a bit harder and represents the first use of a fantasy maker in Fantasy Kit Friday. At the time, Ipswich produced their own kits under the Punch brand (the horse on their crest is a Suffolk Punch), and obviously that couldn’t be used on a Norwich kit, so we opted to create a new maker in Citizen, drawing upon Norwich’s old nickname. The horse trim on the sleeves and shorts is suitably changed to canaries, with the shorts remaining yellow. The overall result is not a million miles from the current Norwich Errea kit, which itself is something of a tribute to their 1980s Hummel offerings.